Besides picking a host of elected officials this November, Vermont voters will also be asked to amend the state’s Constitution. The amendment would allow 17-year-olds to vote in primaries if they turn 18 by Election Day. 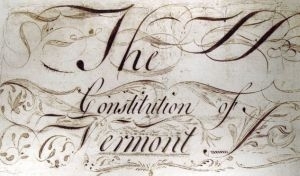 VPR’s Jane Lindholm talks with lawyer and historian Paul Gillies and State Archivist Gregory Sanford about Vermont’s Constitution.